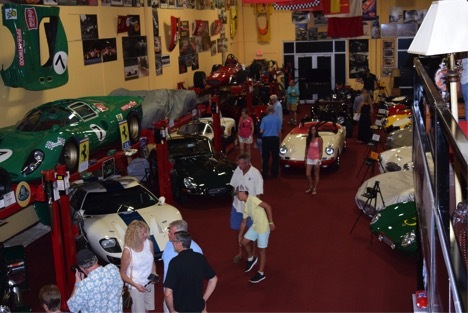 The Wilson Collection consists of approximately 120 unique and historically significant automobiles and is located in a non-descript commercial park in Jupiter, Florida. The number of automobiles fluctuates, some sold when they no longer fit the profile of the collection and others added when tastes change. Dave Polny manages the Collection and is a good friend of mine from his days in North Carolina. 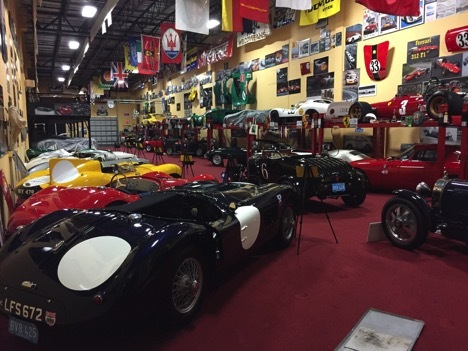 While Dave and I were speaking on the phone recently, he reminded me I had not visited the Collection in a while and invited me down to spend some time with the cars. I said yes, I said yes very quickly! 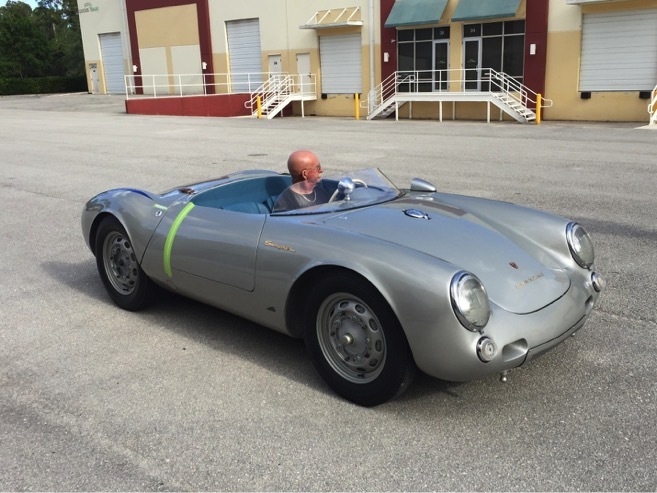 When I arrived, Paul Willison was behind the wheel of the Collection’s 550 Spyder. 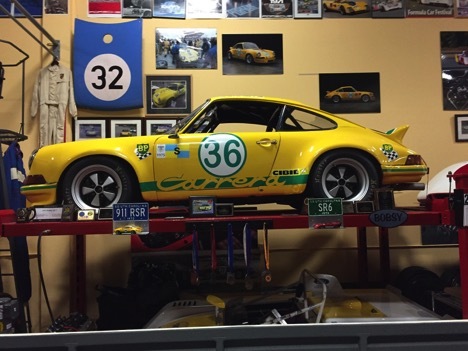 Paul is known for his days at Brumos Racing in the early 70’s and is equally well known for his work over the last 25 years at Willison-Werkstat. This was a wonderful way to begin the trip! 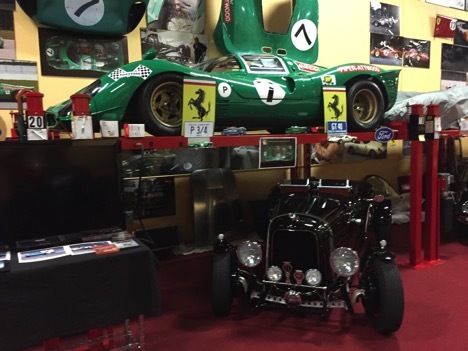 The scope and scale is such that even seasoned "Car Guys" are left speechless when they first see the Collection. For those that followed Porsche sportscar racing in the US over the last 40-years, the name Mike Colucci should be familiar. Mike has 5 overall victories at the 24 Hours of Daytona along with many other victories on his resume. Mike and I both relocated to North Carolina from Jupiter in the early 2000’s, Mike has since moved back to Jupiter. 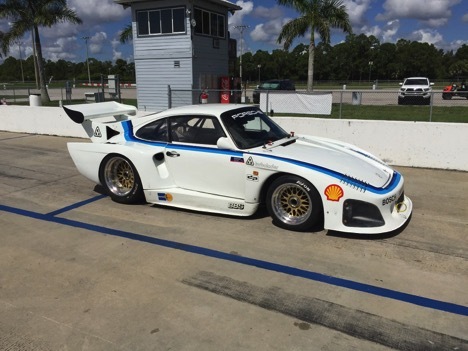 As I planned my trip to Jupiter, I reached out to Ken Gold from Atlantis Motor Sport Group as he was planning a private test day at Palm Beach International Raceway for his 1977 Porsche 935K Factory Werks racecar. 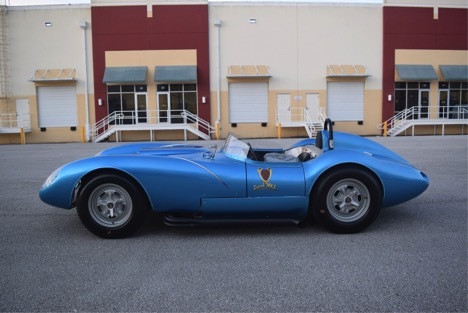 Mike and I made plans to meet Ken at PBIR. 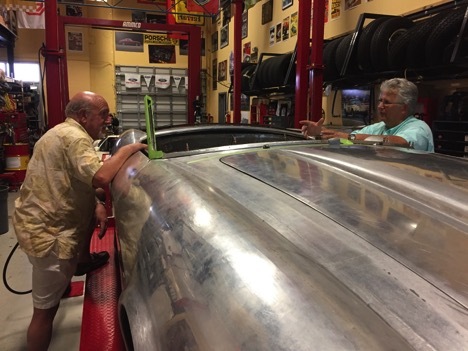 Mike knew the car well and understood Rodger Hawley from Orbit Racing helped Ken prepare the 935. 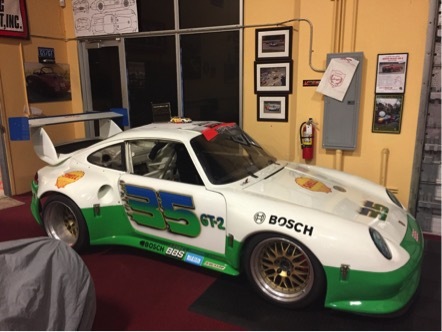 Rodger has been preparing Porsche racecars at the top level for many years and has a Daytona victory to his credit from 2004. 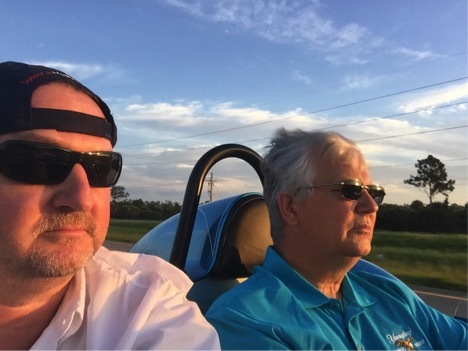 Any day at PBIR with Mike Colucci and Rodger Hawley watching a factory 935 lapping alone is certain to be a perfect day. As it turns out there was also a white 918 Spyder on track this morning. As far as I can tell, the only way to make a Porsche 918 Spyder disappear is have it share the track with a factory 935! 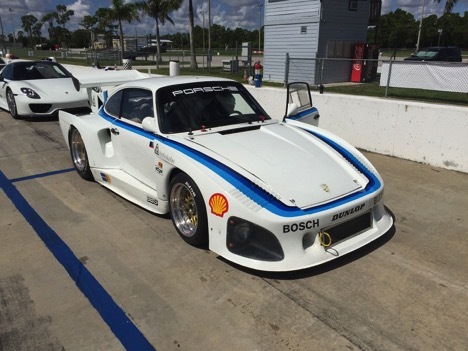 Many thanks to Ken Gold for inviting us to the track to see and hear the 935K. Mike mentioned to me he had never seen the Wilson Collection, so we jumped into Mike’s speed yellow Cayman S and made our way back to the Collection. Mike wears his Rolex Daytona with pride, earned from one of his five podiums at Daytona. 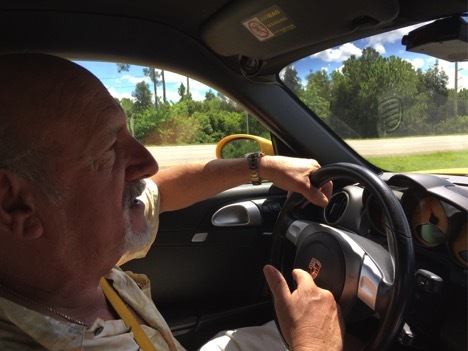 In fact, the Cayman S was hard earned as well, with a recent Daytona victory in 2013 with David Donahue, Shane Lewis, Dr. Jim Norman and Nelson Canache handling the driving duties. 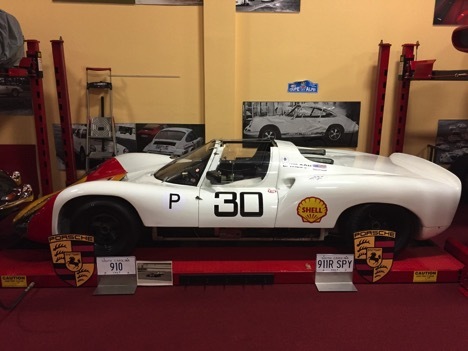 The man is steeped in Porsche racing history. Always a pleasure spending time with Mike, the stories from “back in the day” are simply mesmerizing. Mike’s career started at Brumos Porsche in 1972 working alongside Jack Atkinson and drivers Peter Gregg and Hurley Haywood. For those that know Mike, he does not suffer fools gladly and certainly doesn’t pull any punches when offering his opinion! 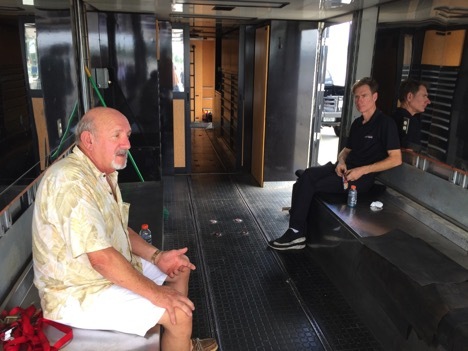 For a guy that has truly seen sportscar racing grow from the early 70’s to what it is today, you listen when he talks. I was looking forward to seeing Mike’s reaction to the scope and scale of the Collection. Mike was speechless when we walked through the simple front door leading into the collection. 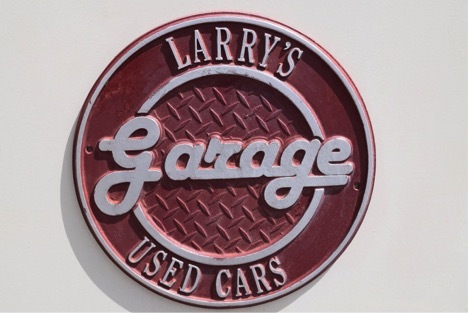 Mike is not easily impressed, but nobody is prepared for what they see when you walk through the door at Larry’s Used Cars. 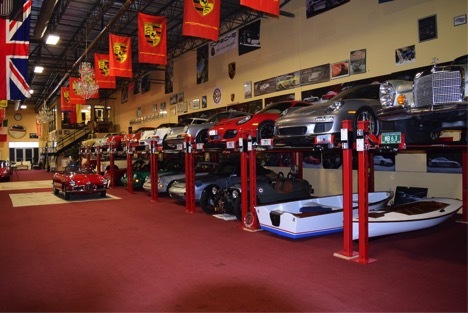 Most car guys know the really great collections are located in industrial parks and are designed to look like another business that either stores product or manufactures gizmo’s and widgets. It really is part of the appeal when you walk into the warehouse not knowing what to expect and you are greeted by this view. 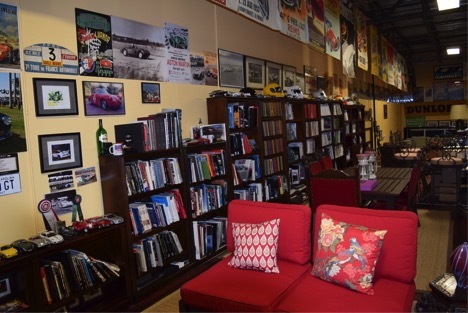 The Collection comprises 18,000sf, air conditioning, crystal chandeliers, board room, library mezzanine overlooking the race room and a full fabrication shop. 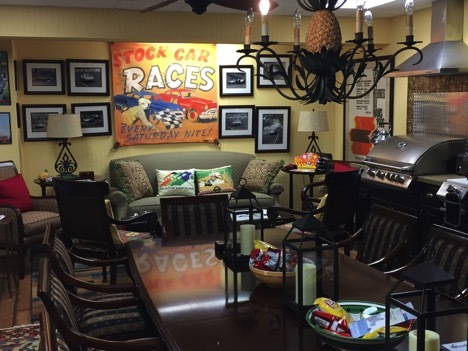 The 3 main rooms are Race room, American room and Collection room. 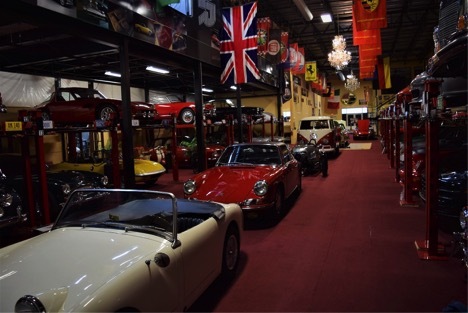 The front door deposits you into the Collection room, it contains some of the tastiest Porsche 911’s imaginable as well as choice Maserati, Mercedes, Alfa, VW and others. Larry Wilson drives or races every car in his collection, The Man is not afraid, he races the RSR’s, new and vintage, as well as the 910. This Collection is not static and collects no dust! 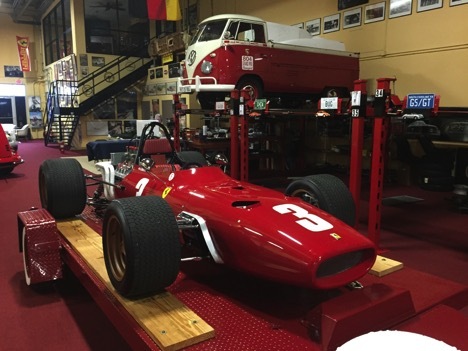 Mike Colucci spent many years repairing crashed racecars and appreciates custom fabrication more than most. 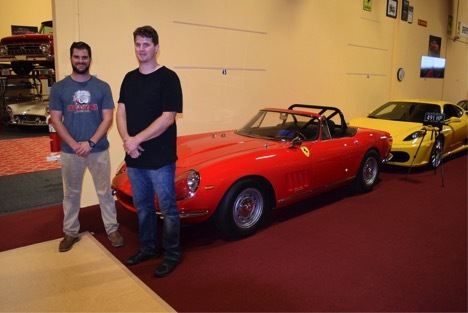 When Dave showed Mike the 1967 Ferrari 275 GTB NART Spyder and explained that most of the fab work was done in house by McPherson College graduates Evan Clary and Oscar Vorhees, well quite frankly, I cannot repeat what Mike said! 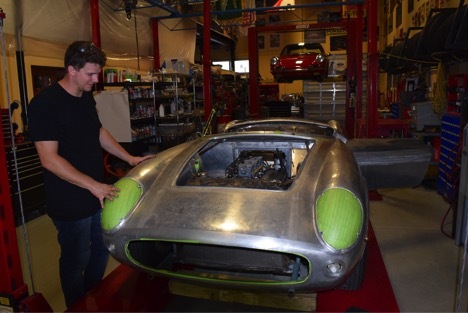 The NART Spyder will be a star at SEMA later this year in Las Vegas. The quality of craftsmanship is second to none and only the best trained Ferrari eye will spot the differences. Not that this car was built to fool anyone, it was built to show off the skills of Evan, Oscar and McPherson College. While I was visiting, Bill Warner called and asked if he could visit the museum and see the NART. Yes, that Bill Warner. Oh by the way, Oscar and Evan are now creating a 1960 Ferrari California Spyder, based on a 1962 330 GT. 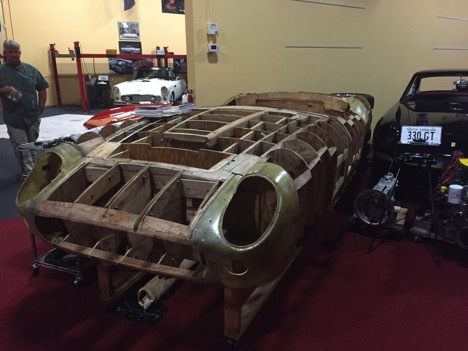 Creating body panels will prove to be a slightly simpler task as the collection sourced and bought a wooden body buck used to create the original 250 California Spyder. Mike and Dave discussed the scope and scale of the Collection's fabrication shop and what was in the works. Here is a small sample of restoration/recreation work the Collection has crafted. 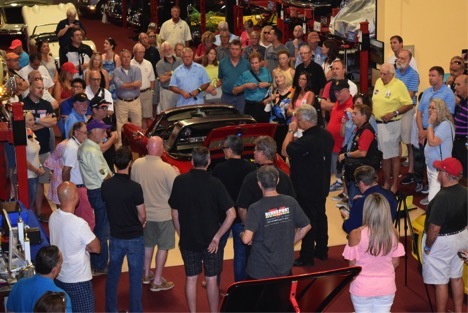 The Collection was hosting the Porsche Club of America Zone 12 Open House on Saturday, for those lucky enough to sign up quickly when registration opened; it was limited to 125 and sold out in minutes. The Collection is very private and when the opportunity to tour the Collection presents itself you have to act quickly! A good time was had by all. The perfect end to a magical trip. The automobiles are incredible but the friendships are what make it special. Many thanks to Larry Wilson and Dave Polny for a weekend that truly is what dreams are made of. Well, the first negative comment in 6 years of hosting events…..Sorry you were disappointed. Brian thank you for your comment, sorry your visit was less than you expected, most had a great day! Allow me to speak to the 1967 Ferrari 275 NART Spyder. The NART was not created to fool anyone, it was an exercise to show off the talents of Mcpherson College graduates and their metal shaping abilities. The NART was created from a Ferrari 400i and was no small accomplishment in terms of engineering and custom metal shaping. The traditional metal shifter gate was crated from metal stock and oh by the way, the shifter is attached to a Tremac transmission underneath! As I said it was not built to fool anyone. The seats were hand crafted by a gentleman responsible for award winning Pebble Beach interiors and were modeled on the seats from the Preston Henn collection 1964 Ferrari 275 GTB/C, a very special Ferrari and 1 of only 3 built. Again, this wonderful handcrafted automobile was simply built because it could be. I expect it to be a big hit at SEMA later this year. Brian I would like to invite you back to the collection to walk through and learn more about the cars and why they are in the collection. While the collection is a total knock-out I was pretty chuffed to see a Bug Eye Sprite heading one of the photos – I’ve just spent the last 3 years in a total resto of my Mk 1 which sat in the back of my garage from 1974 till I retired three years ago.